In an Indianapolis underground parking structure, Frank Behr is on an executive protection detail for Bernard “Bernie Cool” Kolodnik, a hard-driving business mogul on the verge of making a move into big-time Indiana politics. Behr is working for an exclusive investigation company, and it’s an uncomfortable fit, both literally and philosophi­cally. The uneasy stability is quickly rocked by a burst of automatic weapons fire as an attempt is made on the promi­nent client, and Behr manages to protect him and repel the attackers. Though Behr is celebrated for his heroism, he can’t help but investigate what happened in that garage—and why the Indianapolis cops seem to be burying the incident. 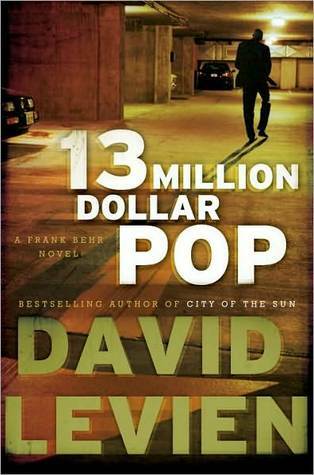 13 Million Dollar Pop is the third of David Levien's Frank Behr series and I was excited to be sent a review copy of M. Levien's newest. I knew of him from his screenplay for Rounders, one of my favorite movies. Not knowing his Frank Behr character I had no preconceived notion of what to expect. But anytime the reader is lead to believe that a new job will be an easy one, well, there's a whole book full of proof that the hero's in for a bumpy ride. This time around, Frank and his girlfriend Susan are expecting a baby and Frank's the new hire. I like Frank. Levien's written him as a bit of a hard boiled, old fashioned kind of detective, in the modern world. This is definitely a man's man kinda guy. Lots of manly men stuff going on. And that's OK. Levien writes this kind of character. 13 Million Dollar Pop is gritty and solidly written with just the right amount of dead bodies and clues that go here and there. We never doubt that Behr will solve this one. That's what makes for a good thriller and a good mystery. Knowing that the lead character will win out in the end. Levien builds strong characters, and a not too complex plot, so it is an enjoyable read without having to take notes to keep up with the story line. I thought the book flowed easily and keeps your interest, there were no slow bits for me. I was easily hooked and found myself trying to figure it out. I'll go back and read Levien's first two Behr novels, I 'd like to see the changes in the development of the character that is the Behr of 13 Million Dollar Pop. I was provided a review copy by the publisher in exchange for a fair and honest review, this copy in no way affected my opinion. Sam Sarkar's The Vault - issue 2 in stores now!